Two days ago, as part of a Twitter discussion about how wasteful and ineffective a border wall would be, I predicted the Republican presidential candidates would recommend massively increased drone patrols and strikes on immigrants at the border, because it’s expensive and unworkable, but would sound cool. To be honest, I thought it would take slightly longer than two days to be proven right. So, how you gonna collect the bottle of Old Overholt? 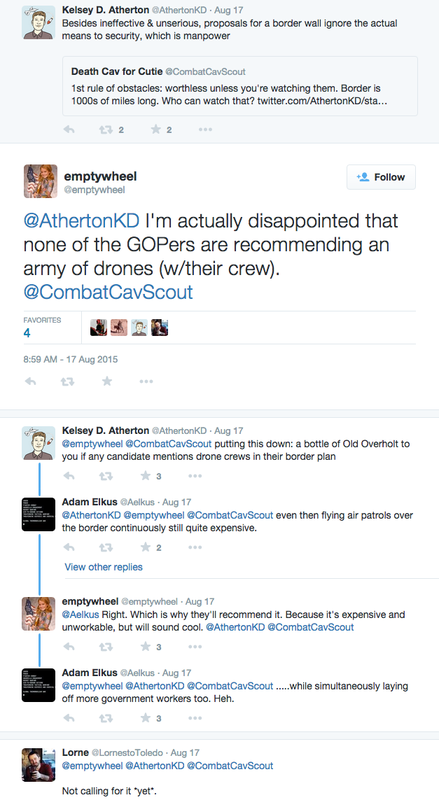 Alas I believe the Old Overholt goes to the GOPer who actually recognizes that humans drive drones, not to me. So I avoided that ugliness. Come on, GOP — land mines would be just so much cheaper. Dimwit: the Rethuglicans spare no expense when it comes to killing their fellow man. Especially when that fellow man is browner than they, or female, or gay, or some combination of those. Land mines – what a great idea! After all, the US is one of the few countries that has not signed the Land Mine Treaty. We should put our words (or lack thereof) into action. I don’t think the landmine lobby is that powerful in Congress anymore. personally, i prefer walls. a wall, or two or three, would be much better for the the american unemployment problems. and we could force cemex to provide the cement and gravel free. finally, there would be a lucrative tourist angle. historically, the great wall of china, walls of jericho, hadrian’s wall, the maginot line and the israeli gaza wall serve as models and advertising referents to our own 650 mile mexico-is-for-mexicans homeland security wall. of course people would pay good tourist money to stand atop that wall at night looking thru night vision scopes with an automatic rifle slung over their shoulder, a drone tethered like a goshawk to their wrist, and deputized to shoot whatever moves out thar. i don’t want to hear some smartass start on about el chapo and tunels. this mexico-is-for-mexicans wall-building business is serious economics, serious ethnic/cultual purity, and serious presidential politics. and dont you forget it. If this takes hold, the next drone strike should take out the Statue of Liberty with its glorious Emma Lazarus poem, “The New Colossus”. That’s just not America any more. On the other hand, being the only country to use drones to kill border crossers would certainly cement our status as “exceptional”, wouldn’t it? The US stole half of Mexico fair and square, so they should stay out of it. Sore losers, is what they are. Surely they are not serious, right? Why not make them into slaves and restart another capitalist growth industry?